Ever since airplane speeds started to approach the speed of sound, the study of compressible flow problems attracted much talent and support in the major indus­ trialized countries. 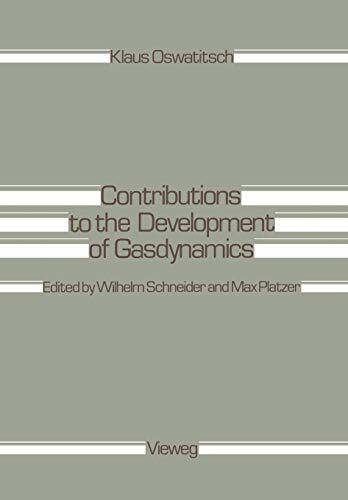 Today, gas dynamics is a mature branch of science whose many aspects and applications are much too numerous to be mastered by a single person or to be described in a few volumes. This book commemorates the 70th birthday of a great pioneer and teacher of gas dynamics, Dr. Klaus Oswatitsch, Professor of Fluid Mechanics at the Technical University of Vienna and former Director of the Institute for Theoretical Gas Dyna­ mics, Deutsche Forschungs-und Versuchsanstalt fUr Luft-und Raumfahrt. Several reasons motivated us to prepare an English translation of Oswatitsch's selected sci­ entific papers. First, we hope that a book containing his major papers will be wel­ come as a valuable reference text in gas dynamics. Oswatitsch's work is frequently used in the literature in one form or another, but it is usually quite time-consuming for the English speaking reader to consult the original texts. As a result, reference to and understanding of his papers is often incomplete. For example, Oswatitsch's formulation of the equivalence rule hardly ever is quoted in recent textbooks, al­ though it preceded declassification of Whitcomb's results by several years. Further­ more, his papers contain much information, which has not yet been fully appreciated in the Anglo-American literature.